I've always been obsessed with photographing clouds. I know that I've mentioned it on a post before and I'm sure this one won't be the last. I've even written a post inspired by Alfred Stieglitz (as are most of my cloud images). It's just something that is so easily passed by and I really don't think a lot of people stop to appreciate the beautiful colors and shapes that are created in the sky. When I shot my first roll of film through the Olympus XA-4, a lot of it was photographs of the sky to use up the roll (something Joe will yell at me for). The cloud images that came from this roll are great. The contrast and color in them is outstanding. I've attached them below so you can take a look. When I first got my Olympus XA-4 camera, I only had color film in it. It was difficult to shoot because every shot I had to think about the fact that nothing may even come out from this because we weren't sure the camera would even work. Turns out it does work. I recently got the roll of film developed and after scanning the negative I'm really please with the turn out. 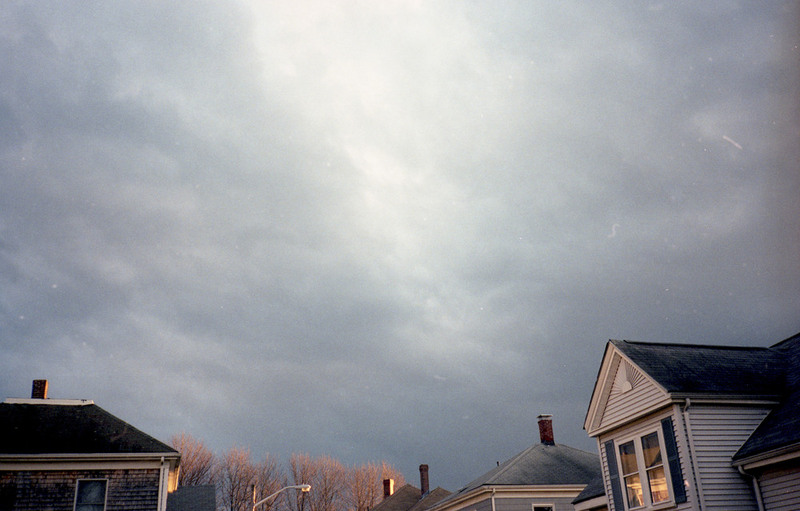 A lot of the images were of the clouds/sky/sunsets (mostly because I wanted to use up the film and get it developed). The contrast within the images is beautiful. I used Kodak Porta 400 film and I've always loved the color rendition from that film. Below are a few images that are my favorites from the roll. The first image is from our last snowfall this year, in April!! There's something really sweet about this image. I love that the viewer can see the warm lights on inside the house while seeing the snow falling outside. 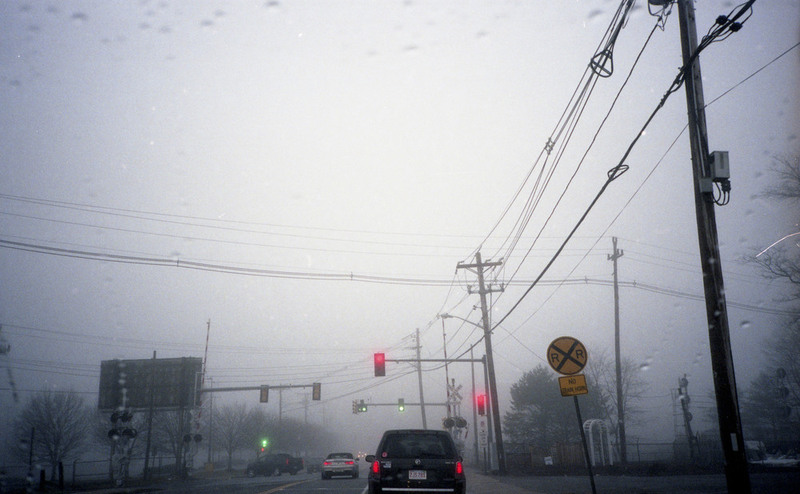 The foggy-ness on the final two images create a mysterious photograph. The first time I was told to go outside and shoot in the fog I was confused. I didn't understand the beauty in fog. Ever since that assignment, I have an urge to go out and shoot when that's what the weather is like. I just want to go to the water and shoot the endless ocean. These two images are simply beautiful. For my birthday this year, Joe got me an Olympus-XA4 - a point and shoot film camera. It's great - it's small enough to just fit in my jacket pocket and it's easy to take with me. I'm on my third roll of film through it and just recently Joe developed my first roll of black and white film. The contrast in the images are beautiful. This is my first roll of black and white film that I've shot since my sophomore year of college, and it took a little while of getting used to. I wasn't too thrilled on the images at first. It's so different than shooting in color when you have to really focus on contrast and composition and forget about color. The first image is one of my favorites. I love the simplicity of the bold lines that draw your eye to focus on the light dancing through the image. The door handle just on the edge of the photo keeps your eye from wandering. I really enjoy the light that is sprawled across the wall. I was sitting at the drive-through when I saw this. Sometimes its the small things that catch your eye. For the second image, I was sitting in traffic (this is when I take a lot of images.) I love to just look when I'm stuck in traffic. I love photographing houses and the space between houses. It's interesting to see how they interact with each other and the conversation that takes place in the space between each of them. The lighting on these houses were great too - I love that low afternoon light when the sun creates shapes with the shadows from buildings. The last image is really great too. I was drawn to this space because of the shadows on the drive way. Instead of just focusing on the shadows, I created a composition that shows the relationship of the driveway and the backyard. The driveway and the fence are just about touching and then there's another fence that is not connected to the first one. The shadow from that fence leads your eye out of the image through the bottom left corner. I try to create compositions that challenge the normal ratio of a space. Every so often we head into Boston to walk around the North End, grab some lunch, and do some street photography. We took the train in a couple of weekends ago when it was actually starting to get warmer out. It had been a while since we were last there because of the cold, cold, cold months. I'm usually very hesitant about street photography because I have a fear of someone calling me out and yelling at me. I want to go unnoticed. Watching Joe, I have learned that a lot of people are oblivious as to what goes on around them. I've seen him go directly behind someone and photograph them and they don't even notice. When you watch one of the best, you'll learn from one of the best. We always walk through the Boston Public Market - it's always the same thing but it just smells so good (those cider donuts by the door!). After we made our rounds through that, we saw that the outdoor public market was going on. It was my first time ever experiencing this in person but I have heard so much about it! It was pretty insane - there are just a ton of produce vendors selling fruit and vegetables at a ridiculously cheap price. Some vendors were selling an entire flat of strawberries for $2! We didn't buy anything because we were still planning on walking around, but we stayed around the area for a good while and photographed the people. I felt confident in this area because there were just SO many people that I knew no one would say a word to me about photographing "things" (aka, them). After editing my images and looking at the chosen ones as a whole, I've decided to split these images up into a few blog posts. This post will be focusing on angles and really planning out a composition. When I took this photograph, the white tarp draped through the middle portion of the frame caught my eye. The bright white against the sky creates a contrast in color and shape. After I took this photo, I wasn't too sure about the woman on the side but I think it adds another depth to the image. I've always focused on what goes out of the frame, as well as what's going on. I think it's equally as important to pay attention to the corners of a composition. I love the way the stairs bring your eyes down towards the man coming up the stairs. The lime green really carries your eye, again, to the man walking up the stairs. These angles really work to bring your eyes to the main subject of the photograph. This is a photograph that is really interesting to me. There's something about not seeing a face to the body in an image that stirs your curiosity. It shows that you don't need a face to create a story because this is a story in itself. But the one thing I think that really makes this image successful is the way the shadows fall out of the image. The shadows lead your eye from the outside of the frame, into it and up to the man with the bags. At the end of February, we took a road trip up to Chittenden, VT for a wedding. Vermont is about three-four hours away from us but surprisingly we've only made a trip up there one other time together. It felt good to get out of Beverly for the weekend and get away from our routine. Sometimes that's what is needed most - change. The wedding was at the Mountain Top Inn and it was insanely beautiful. We got there at night so we really couldn't see much of the view but in the morning, it was incredible. Our room had a huge window facing the mountains and it was just breath taking. I wouldn't mind waking up to that every morning. When we got there on Friday, they had a big get together for dinner and drinks. We got there a little late but outside they have a hill and had sleds for everyone to go sledding. There was also a fire for the guests to make their own s'mores. It was really creative and a great idea for a winter wedding. On Saturday, the day of the wedding, we all got up and had breakfast and then me, Joe, and his brother decided to go on a hike and explore more of the area. We walked down the hill and went towards a lake that we could see from the hotel (seen above). When we got down there, there was a fire pit so we started a fire and stayed around the area for a little bit. It was relaxing and great to be outside in that weather. Even there we were surrounded by snow, it was great weather. I definitely would love to go back there at some point and explore more of the area!